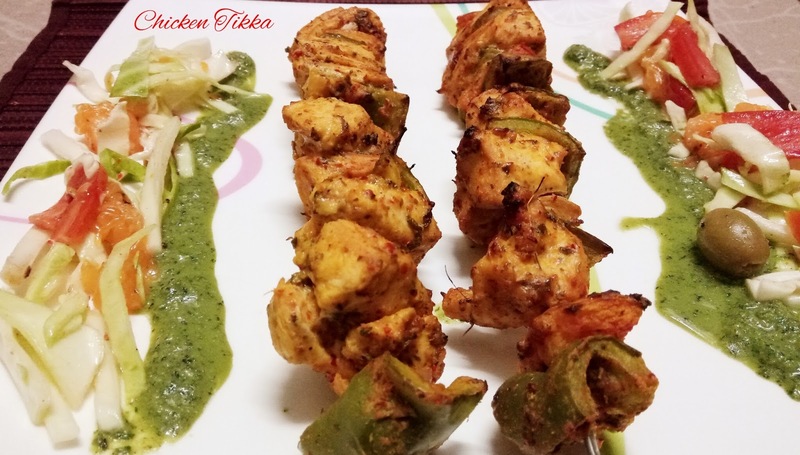 Tandoori chicken tikka is one of the most popular chicken appetizer/starter originating from Punjab.The word Tikka basically means “bits” or “pieces”. Small pieces of boneless chicken is marinated in spiced yogurt mixture and left for few hours to tenderize chicken and absorb flavors.Then the chicken cubes are brushed with clarified butter/ghee at intervals to enhance the flavours and grilled in tandoor oven or barbecued .This is the basic original recipe of chicken tikka ,one can stick to this basic recipe and add flavors of their choice depending on their tastes and mood.Enjoy your weekend with this hot tandoori chicken tikka with some some mint chutney and onion rings……! Take all the spices,hung curd,ginger garlic paste and gram flour in a bowl and mix well.Add Chicken cubes,wipe it dry , mix well and marinade for minimum 1 hour or overnight in refrigerator. Add all the cubed vegetables to the chicken marinade ,keep it for 5-10 minutes. Arrange chicken and veggies alternatively on skewers and bake in the convection oven at 220 deg Celsius for 18 minutes.Pause at 10 minutes,brush with little butter and continue baking for another 8 minutes. Brush with butter and grill for another 2-3 minutes to get that charred spots . Serve hot with Pudina Chutney / Mint Chutney and Onion rings.